Ogwen Valley Mountain Rescue Organisation members were alerted about 1.30pm on Thursday after the man slipped in poor winter conditions while walking alone on Tryfan. The walker tumbled about 15m (50ft) on the south-western slopes of the mountain, and suffered scalp lacerations and other cuts and bruises. Chris Lloyd of the rescue team said: “Fortunately, he remained conscious and was able to make the 999 call despite much blood loss. 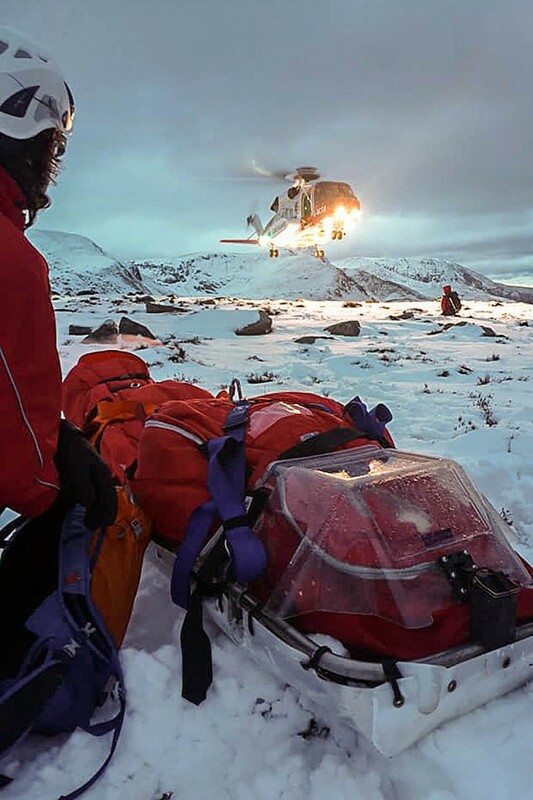 “Ogwen MRT was mobilised and due to the high likelihood of a long technical rescue and stretcher carry, they were supported by 12 members of RAF Valley mountain rescue. “The Coastguard’s helicopter was mobilised but was unable to get to the casualty due to low cloud and turbulence. However, it was able to make several lifts from Oggi Base up to Cwm Bochlwyd, in the shadow of the West of Tryfan. “Shortly after 4pm the hasty party located the casualty lying in an orange survival shelter surrounded by red snow. Having treated his severe scalp wounds, he was loaded on to the stretcher. Rescuers then set up ropes to lower the injured man to a better site, with 25 members taking part in the operation. Mr Lloyd said: “Again the helicopter tried but the turbulence was too strong. “The stretcher party carried the casualty to near the outfall of Llyn Bochlwyd shortly after 8pm and from here the helicopter successfully winched the young man onboard for the short flight to hospital in Bangor. “After the casualty had made his 999 call, he telephoned his parents who rushed from the Wirral to Oggi Base. They could see the attempts by the helicopter but were able to appreciate the difficulties for both the helicopter and the 25-strong rescue team. By 9pm, all rescue team members had returned to the Ogwen Valley MRO base for hot drinks and soup. Good luck to the dude who was injured. I was following a young bloke just after midday yesterday but I deemed it too risky so turned back from just above 600 metres elevation. Would you know if this was a young bloke? I am the rescued climber and would like to send my sincerest and heartfelt thanks to everybody from OVMRT! Without them, I would not be here, that’s an absolute fact and I am forever in their debt. I’m still in Bangor awaiting the results from an MRI having broken my back in 2 places as well as my coccyx. I’m stable and my head wounds are just superficial — I count myself incredibly lucky and also extend my thanks to the Coastguard flight crew and all at the hospital. Thanks again to all those involved in the rescue, an incredible effort given where I ended up! i wish you a speedy recovery and nice to hear that you could look after yourself till help arrived. Thanks for the update Tom, and I hope you make a full and rapid recovery.